Eugene W. Robbins, The Robbins Families of New England, , at https://books.google.com/books?id=-lhPAAAAMAAJ . [Spicewood, Tex. ]: (2004) , p. 141. Charles Hudson, History of the Town of Lexington, Middlesex County, Massachusetts, , at https://books.google.com/books?id=BEEOAAAAIAAJ . Boston and New York: Houghton Mifflin Co., (1913) , p. 199. Lucius Robinson Paige, History of Cambridge, Massachusetts. 1630-1877: With a genealogical register, , at https://books.google.com/books?id=Yc00AQAAMAAJ . New York, Cambridge: H. O. Houghton and Company, (1877) , p. 509. Thomas W. Baldwin, Vital Records of Cambridge, Massachusetts, to the year 1850, Boston: Wright & Potter Print. Co., (1914) , Vol.2, p. 503. Thomas W. Baldwin, Vital Records of Cambridge, Massachusetts, to the year 1850, Boston: Wright & Potter Print. Co., (1914) , Vol.1, p. 134. Thomas W. Baldwin, Vital Records of Cambridge, Massachusetts, to the year 1850, Boston: Wright & Potter Print. Co., (1914) , Vol.1, p. 135. Samuel Robbins was born perhaps about 1706. Thomas W. Baldwin, Vital Records of Cambridge, Massachusetts, to the year 1850, Boston: Wright & Potter Print. Co., (1914) , Vol. 2, p. 720. "Maine Marriages, 1771-1907," database, FamilySearch (https://familysearch.org/ark:/61903/1:1:F4F9-G2X : 4 December 2014), Albion K. P. Roberts and Caroline E. Elliott, 06 Mar 1868; citing Bradford,Penobscot,Maine, reference ; FHL microfilm 10,579. "Maine Vital Records, 1670-1921", database with images, FamilySearch (https://familysearch.org/ark:/61903/1:1:VZ3B-LY3 : 27 December 2014), Lewis Walter Doyen and Angie Emma Roberts, 1904. "Maine, Marriage Index, 1892-1966, 1977-1996," database, FamilySearch (https://familysearch.org/ark:/61903/1:1:KCJZ-QXD : 27 November 2014), Lewis W Doyen and Angie E Roberts, 25 Sep 1904; citing Marriage, Maine, United States, State Archives, Augusta. "Maine, Nathan Hale Cemetery Collection, ca. 1780-1980," database with images, FamilySearch (https://familysearch.org/ark:/61903/1:1:QVJ5-73V8 : 30 October 2014), Angie E Doyen, 1934; citing Garland, Penobscot, Maine, United States, Evergreen Cemetery, Maine State Library, Augusta; FHL microfilm 1,315,192. "United States Census, 1920," database with images, FamilySearch (https://familysearch.org/ark:/61903/1:1:MFZT-KW2 : 14 December 2015), Walter L Doyen, Exeter, Penobscot, Maine, United States; citing sheet 5A, NARA microfilm publication T625 (Washington D.C.: National Archives and Records Administration, n.d.); FHL microfilm 1,820,646. Eliza married John Leavitt Ruggles, son of Gershom Cheney Ruggles and Mary Cheney Neal. 1880 United States. Bureau of the Census. 10th census, Vermont, 1880 federal census : soundex and population schedules, Washington, D.C.: The National Archives,, ([19--?]) , FHL Film 1255347; National Archives Film T9-1347; Page 276D. 1880 United States. Bureau of the Census. 10th census, Vermont, 1880 federal census : soundex and population schedules, Washington, D.C.: The National Archives,, ([19--?]) , Census Place: Rutland, Rutland, Vermont; Roll: 1347; Family History Film: 1255347; Page: 276D; Enumeration District: 187. 1900 United States. Census Office. 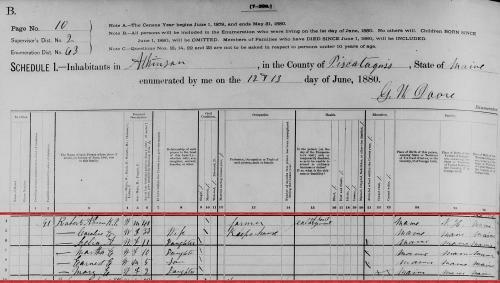 12th census, 1900 population census schedules, Washington, District of Columbia: Bureau of the Census Micro-Film Laboratory, ([197-]) , "United States Census, 1900," database with images, FamilySearch (https://familysearch.org/ark:/61903/1:1:MMLB-RRZ : 20 January 2015), Flossie B Roberts in household of Alber? C Moore, Foxcroft town, Piscataquis, Maine, United States; citing sheet 8A, family 176, NARA microfilm publication T623 (Washington, D.C.: National Archives and Records Administration, n.d.); FHL microfilm 1,240,598. Maine State Archives; Augusta, Maine, USA; 1892-1907 Vital Records; Roll #: 46. 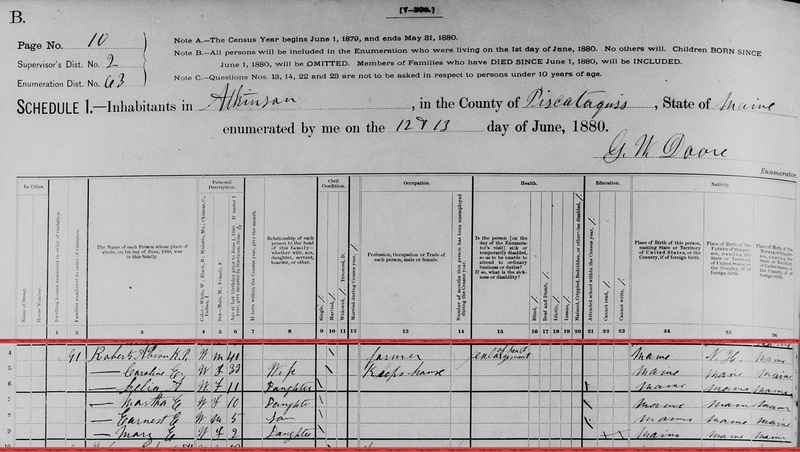 "United States Census, 1900," database with images, FamilySearch (https://familysearch.org/pal:/MM9.3.1/TH-266-12068-150380-22?cc=1325221 : 5 August 2014), Maine > Piscataquis > ED 135 Foxcroft town > image 15 of 33; citing NARA microfilm publication T623 (Washington, D.C.: National Archives and Records Administration, n.d.).